That's right, ANOTHER party is looming on the horizon for a certain little fella who is pushing the big OH-THREE. He totally knows that it is coming up too, every time I do anything he asks if it is for his party. If you would like to see his other parties, you can click here for this 1st birthday, and here for his 2nd. For the first time, we will be having the party here at our house. I am so nervous, because I have never, EVER, had a party at any of our homes. The most I have ever had was when people came over to meet Luke right after he was born! Where will everyone sit? I have no idea. The floor? Nevertheless, I finally got the invitations out last week, so I wanted to make sure I got it up here as well (we all know I am going to lose the actual invite, so this stands as a record for us). I learned my lesson about having outdoor parties in November after his first birthday party (40 degrees - brrr), so I am going to try to turn my house into an indoor campground. I've got some ideas, but I am also hitting some snags (like seating). Feel free to shout out ideas in the comments! I love a good brainstorming session! P.S. For anyone interested, I made the invitation mainly in Picmonkey, printed it on cardstock, slapped a stamp on the back and sent it out postcard style. That sounds like so much fun! And for seating, maybe hay bales wrapped in flannel? It'll make a bit of a mess sure but it should be cheap. I really like that, but I think my allergies would straight up rebel! That is a fantastic idea!! So much fun, and perfect for a little boy! What about getting some big logs to sit on and putting felt on the bottom so they don't scratch the floor. Hey Bekah, I think your dad and I have 2 of your lawn chairs in our car from Luke's party. For those of us 50 and younger :), what about pillows on the floor? Ask everyone to bring a chair they would take camping! Then you don't have to worry about setting anything up and you should end up with the appropriate amount of (portable) seating for all parts of the event. If it's a "camp-out", why not have everyone sit on the floor on picnic-type blankets? Thanks Sara! I didnt know Christin had a blog! Definitely off to check it out! This is such a cute idea! And so was your last party, you rock at this! 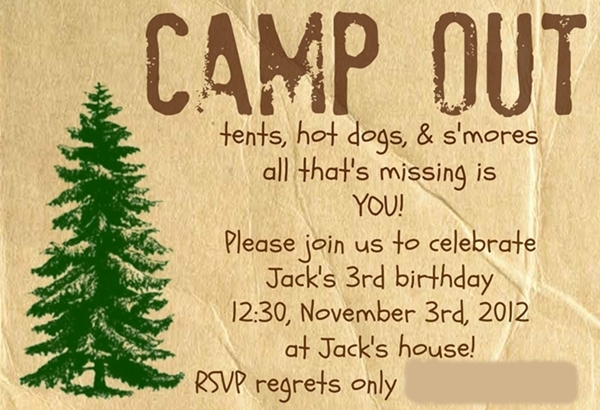 As far as seating, if it's camping themed have guests bring their own folding camping chairs. That's what we do whenever we have a bonfire/camping get together!